Following the isolation of targeted ES cell clones, chimeras are made using either blastocyst injection or, more recently, aggregation techniques (Figure 9.2). In the blastocyst injection technique, ES cells are microinjected into the fluid-filled blas-tocoel cavity of 3.5-d-old embryos at the blastocyst stage. The blastocyst injection apparatus commonly includes an inverted microscope and micromanipulation equipment. The blastocyst is positioned using a holding pipette, and 10 to 15 ES cells are introduced into the embryo using an injection pipette. Both the holding and injection pipettes are fashioned from drawn glass capillary tubing using a microforge. 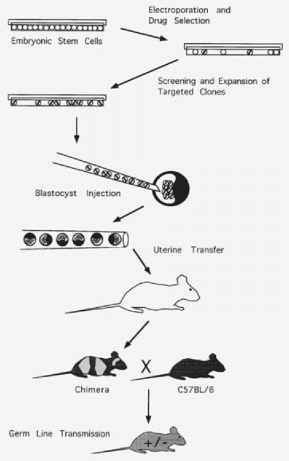 The injected embryos are then surgically transferred into the uterus of pseudopreg-nant female mice. Pseudopregnant females are generated by matings with vasecto-mized males. The act of copulation initiates the endocrine changes of pregnancy, providing a suitable uterine environment for the survival and implantation of the transferred embyros. These animals will then give birth to chimeric mice, which are partly derived from the injected ES cells, and partly derived from the host embryo. For example, ES cells derived from a 129 substrain with an agouti coat color are often injected into embryos derived from black C57BL/6 mice, resulting in chimeras with coats containing black and agouti patches. 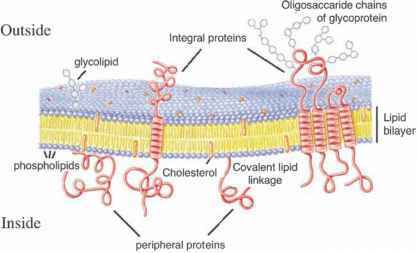 The extent to which the ES cells have colonized the animal may be roughly approximated by the extent of the agouti contribution to the coat. It is also notable that marked strain effects exist in the extent to which ES cell progeny colonize host embryos. For this reason, most investigators use the proven combination of 129-derived ES cells and C57BL/6 embryos. For investigators who are experienced with these techniques, over 30% of injected embryos can give rise to germ line competent chimeras. Blastocyst injection methods require a significant degree of expertise and access to microinjection setups that some investigators find prohibitively expensive. Recently, alternative aggregation techniques have been developed for the production of chimeric mice.31 These methods involve the harvest of morula-stage embryos, the removal of the zona pellucida, and coculture with ES cells. When 10- to 15-cell clumps of ES cells are cultured in apposition to such morulae overnight, they become integrated into the embryo inner cell mass. Embryos that have incorporated ES cells are removed from culture and introduced into pseudopregnant females by uterine transfer. Using these techniques, over 10% of transferred embryos may develop into germ line competent chimeras. Aggregation methods are gaining in popularity; aside from a dissecting microscope, no specialized equipment is needed and only basic embryo manipulation skills are required. Procedures required for the generation of mice with targeted mutations. In this example, the coat of the chimera contains black and agouti patches. Germ line transmission of ES cell genetic material is indicated by the generation of completely agouti offspring. conversion phenomenon may occur, so that the number of male chimeras exceeds that of females. Commonly, chimeras derived from agouti strain 129 ES cells are bred with C57BL/6 mice. Because the agouti allele is dominant, germ line transmission of 129 genetic material is indicated by pups with agouti coats. Such animals have a 50% likelihood of bearing one copy of the targeted allele. The percentage of agouti pups varies widely among chimeras. Typically, genomic DNA is prepared from tail biopsies of these animals, and genotyping is performed by PCR or Southern blot analysis. Heterozygous mutant mice are then crossed to produce homozygous mutant animals that completely lack the normal gene product.